Board games are a wonderful way to bring friends and family together to play, free-associate, and drink heavily. 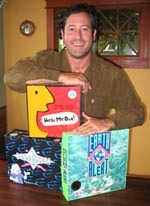 Michael Stusser is the creator of The Doonesbury Game with Garry Trudeau ("Best Party Game of the Year" by GAMES Magazine), EARTHALERT, The Active Environmental Game (Parents Choice award-winner). and Hear Me Out (with Mike Schiller), which was launched at Starbucks in 2006 and is now available at toy stores worldwide. 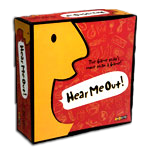 “Hear Me Out“ was launched at Starbucks stores in May, 2004, and has become one of the top selling games in the country. No matter what you bring to the table, Hear Me Out will send you away entertained, educated, and armed with compromising information about your fellow players. Saving the Planet Has Never Been So Much Fun! 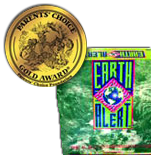 EARTH ALERT is an entertaining and provocative board game for the new millenium. With four engaging categories, EARTHALERT is a fun way to learn more about our planet and get actively involved in saving it. 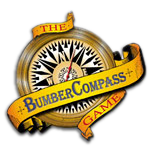 Bumber Compass is an innovative new game that allows players to see the Bumbershoot Arts Festival by participating in a fun, interactive activities throughout the Seattle Center. Using the Bumber Compass Game Card, festival-goers are taken on a exciting scavenger-hunt journey, exploring the arts and winning prizes along the way.